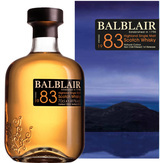 Appearance: The first release of Balblair 1983 has a rich golden appearance. Aroma: On the nose there are warm aromas of butterscotch, toffee and vanilla that come from the long years of maturation in American oak ex-bourbon barrels. Citrus fruits can also be detected in the aroma adding to the complexity of this exceptional Vintage. Taste: On the palate it is sweet and spicy; with overtones of fresh fruits and honey. Finish: A long, warming and full bodied finish.